Update 4/13/2017: The University of Illinois Extension Program has created a fact sheet for identification of boxwood blight. Download the factsheet here. Late last year, a colleague asked me to have a look at a boxwood planting at a residence in Winnetka. He indicated that it was looking poor and dropping some leaves. I have seen boxwood with various problems, so I was already guessing what it could be. Upon arrival, I noted bare sections that had dropped leaves, but also noted strange black streaks on the stems. I ran a moisture chamber test that revealed pink-colored mycelial growth on the leaves, an indication of Volutella blight (a common disease on boxwood that I have seen many times before). More alarmingly, I saw white mycelial growth on the stems that could be signs of boxwood blight—a serious disease of boxwood that has never been found in Illinois. With this in mind, I expressed a sample to the University of Illinois Plant Clinic for diagnosis. About two weeks later, I received a call from the Illinois Department of Agriculture (IDOA) regarding the sample, and yes…it was positive for boxwood blight. Since then, boxwood blight has been found in two other locations in Illinois. All have been traced to nursery stock that came from a source that was not in Illinois; this is good. The IDOA is hopeful that these are isolated incidents that can be contained. Later this month, the IDOA will likely issue a “nuisance declaration” for boxwood blight; this will allow them the authority to mandate proper removal of infected boxwood in an effort to stop any spread. 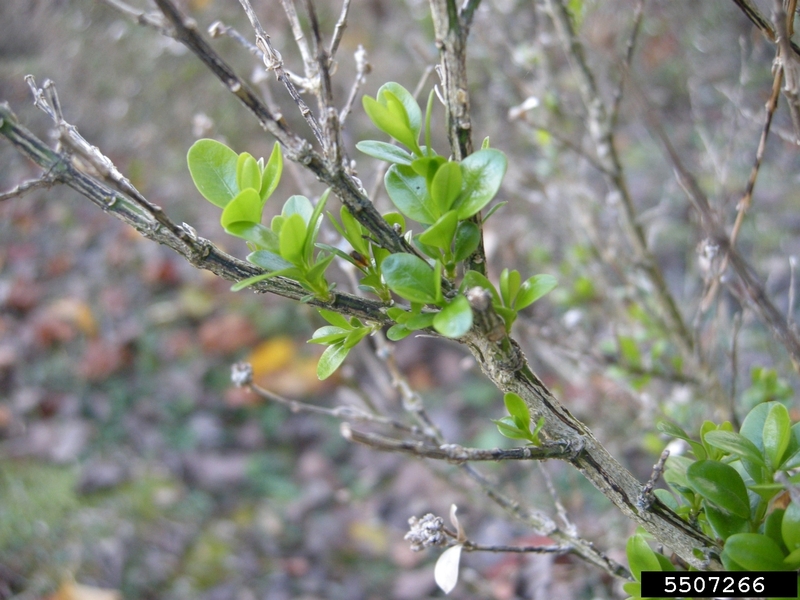 Boxwood blight was first discovered in the United States in 2011. Currently, it has been identified in 18 states, primarily in the east. It is being managed at a state level, with various states having different regulations. Some states require nurseries to practice boxwood blight cleanliness programs to ensure the plants they sell are disease free. Here at the Chicago Botanic Garden, we are developing protocol to monitor incoming plants and to monitor our existing collection. Now that boxwood blight has been found in Illinois, and because boxwood is such a common landscape planting, I feel we should all have a good understanding of this new pathogen. There is no need to panic, but if you have boxwoods, you should monitor them this growing season. 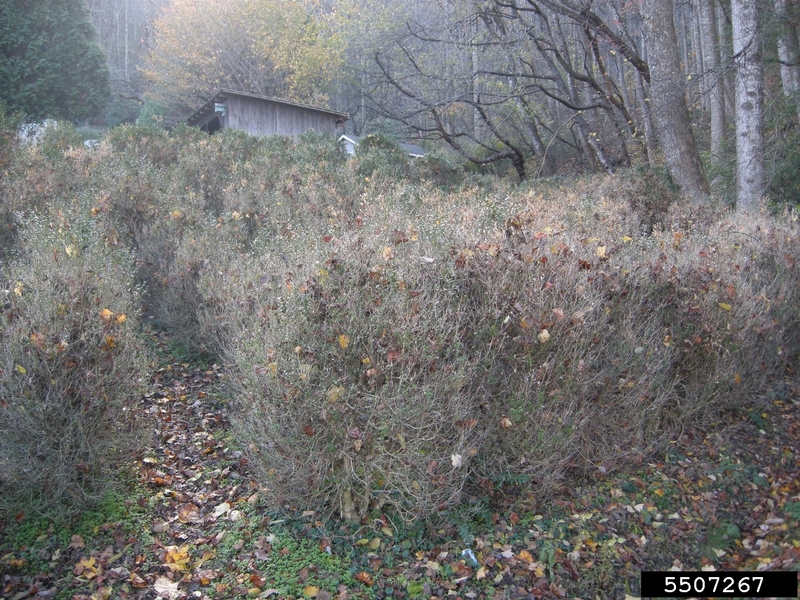 I will briefly review boxwood blight for you, but you can find many great fact sheets online by searching for “boxwood blight.” One fact sheet that I found very comprehensive was titled, “Best Management Practices for Boxwood Blight,” from the Virginia Cooperative Extension. Also, the Garden’s Plant Information Service can help you with questions about boxwood blight, but we ask that you do not bring in samples. Call (847) 835-0972, or email plantinfo@chicagobotanic.org. 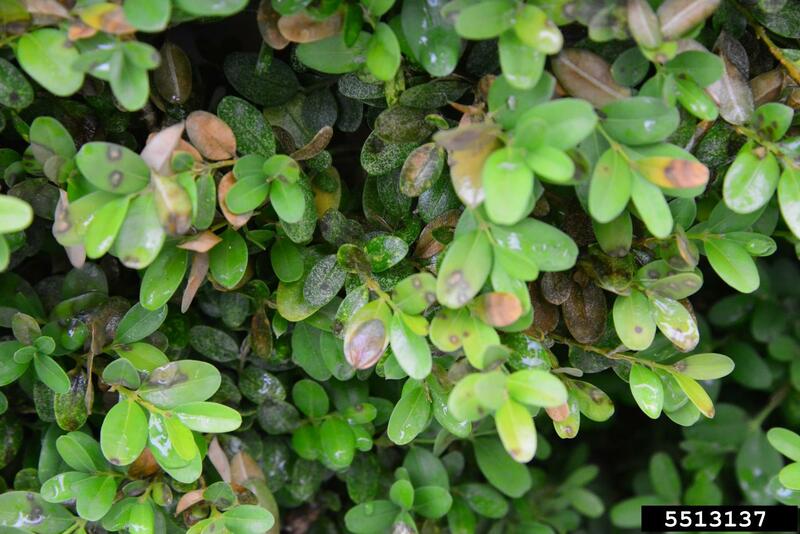 Boxwood blight (Calonectria pseudonaviculata) is a serious fungal disease that primarily affects boxwood (Buxus spp. ), but can also hit Japanese pachysandra (Pachysandra terminalis), and sweetbox (Sarcococca spp.). 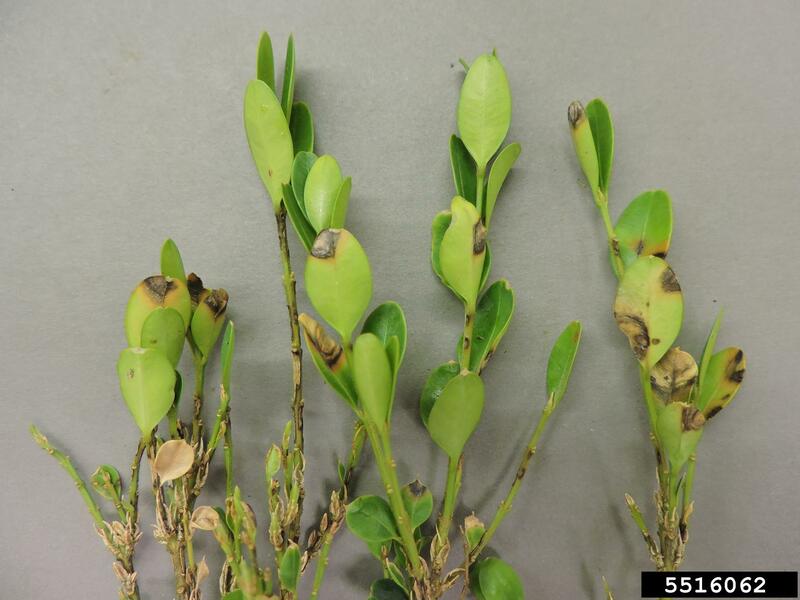 Boxwood blight causes leaf spots, stem cankers, and defoliation. The pathogen itself does not kill the plant, but weakens it to a poor state of health, allowing secondary pathogens to kill the plant. The primary means of spread is by movement of contaminated plants, but it can also be spread via pruning tools, clothing, equipment, and contaminated soil/organic matter. The pathogen can survive in soil and organic matter for years and is easily disseminated by water movement. Leaf spots—light or dark brown circular lesions, often with a yellow halo. Stem cankers—dark brown to black cankers on the stem, diamond shaped or as vertical streaks. Defoliation—sections of the plant dropping leaves. If you feel you have found boxwood blight, you should contact the IDA or send a sample to the University of Illinois Plant Clinic for diagnosis. Please do not bring suspect samples to the Garden. Inspect purchased plants carefully before bringing them home. Plant in locations with good air circulation. Prune to increase air circulation. Sanitize pruning equipment before going from one plant to another. Lysol disinfectant works well. Water at a time of day that the plants will dry quickly. Avoid overhead watering if possible. If desired for a hedge or mass planting, it is best to plant loosely and allow them to grow into each other; do not plant tightly. If we learn of anything new with boxwood blight in Illinois, we will do a follow-up blog. For now don’t panic; just monitor, monitor, monitor. The Garden is a member of the Sentinel Plant Network, a group that unites botanic gardens in monitoring and providing education on exotic plant pests and pathogens, and works in partnership with the National Plant Diagnostic Network (NPDN). If you are a plant and bug person like me, please consider becoming a NPDN First Detector and help be on the lookout for these exotic plant pests and pathogens. The NPDN offers an online training course to become a First Detector at firstdetector.org. It’s free, and upon completion, you even get a printable certificate!